Dr.Lampong Klomkul is a researcher in ASEAN Studies Centre, Mahachulalongkornrajavidyalaya University, Thailand. 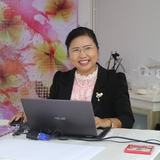 Lampong Klomkul updated their profile information. Lampong Klomkul changed their profile image.